Lisa Rau co-founded Fíonta in 2001 with Jeff Sullivan, and served as the organization’s CEO until April 2018. She currently serves as Fíonta’s Chief Growth Officer and Chairman. 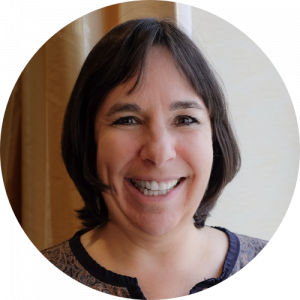 Lisa is a well-known thought leader in the nonprofit technology field and continues to provide strategic technology consulting to select clients. Lisa started in Computer Science at the University of California at Berkeley, where she majored in Electrical Engineering and Computer Science, receiving a B.S., continuing on to receive an M.S. as part of the first cohort of graduates of the Berkeley Artificial Intelligence Research (BAIR) group. At BAIR, she was assigned the email address, lisa@berkeley.edu, in the early years of the Internet! She went on to complete her Ph.D. in Computer Science, specializing in Artificial Intelligence. She was an NSF visiting scholar had an office at Penn adjacent to the Eniac, the first fully programmable electronic computer (famously programmed by female engineers while men took the credit). She led AI research for eight years at GE Corporate Research, where she published 50-some articles in peer-reviewed journals and conference proceedings. In 1990 the magazine Popular Science quoted Lisa as saying, “In the future we can imagine the computer as a librarian who not only knows where all the information in the library is kept, but has read and understood everything.” She feels partly vindicated, but is still imagining what the future holds. Before founding Fíonta, from 1993-2001, Lisa was a senior executive at a commercial information technology services firm where she had profit and loss responsibility for IT services contracts of over $35M in annual revenue, managing a staff of over 300. She lives in Washington, DC with her husband of over 30 years. Lisa loves to ride her bicycle, read, and travel all over the world.